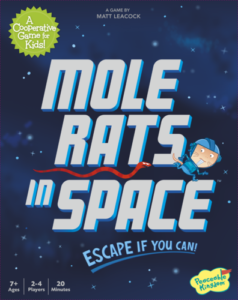 Before posting this Mole Rats in Space review, I knew that I wanted to get kids of different ages to test it out. Well, I’ve now had a chance to play it with both kids and adults and am ready to tell you what we all think about it! What is Mole Rats in Space? 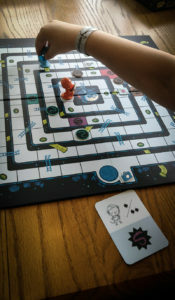 Mole Rats in Space is a cooperative board game for kids in which you are mole rats attempting to flee the snakes that have invaded your space station! The game was designed by Matt Leacock (Pandemic, Forbidden Island) and was published by Peaceable Kingdom. Setting up the Mole Rats in Space board is extremely simple – put the board in the middle of the table, then place the four snakes and four equipment pieces on their matching spaces. Everyone will get a mole rat of their own, a med kit, and their first card. Then you’re ready to go! On your turn, you will do whatever the picture on your card says to do. Actions include moving yourself, moving everyone in your group, moving the snakes, and adding more snakes to the board. Most cards have a top half and a bottom half, with the top being the team’s actions and the bottom being the snakes’. When moving around the board, you will want to pay attention to where your final stop will be. If you land on a ladder, you will move up a level in the space station. If you land on an air shaft, you will move further down into the space station or even out of the ship altogether. This is also the case with the snakes, so you will want to look out for opportunities to get them to land on those air shafts. If you ever run into a snake (or a snake runs into you), then you need to use your med kit to heal up. You only get one med kit, though, so you have to avoid that second bite! 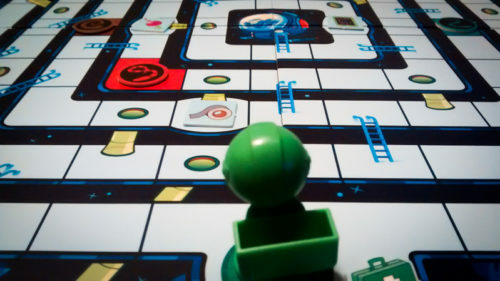 To win the game, you have to work together to pick up the four pieces of equipment in the space station and everyone has to make it to the escape pod. If anyone gets bitten twice by the snakes, everyone loses. If anyone falls through the air shaft and out of the space station, everyone loses. If a snake makes it to the escape pod, guess what, everyone loses. Finally, if the deck of cards runs out and the current player has no card to play, thennnnn… you lose. Once you’re able to beat the game three times, you can crack open the Challenge envelope, which will add cards to the game that will make it a bit tougher. What we all liked the most about Mole Rats in Space is that it is extremely easy to teach and learn. Once everyone understands what each picture means, it’s a breeze from then on. The board looks fantastic! Everything is nice and vibrant, including the ladders, the air shafts, and the escape pod. 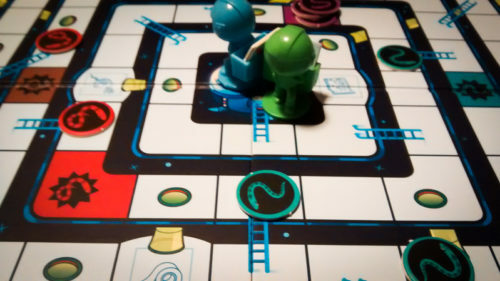 Plus, the mole rats themselves blend into the board wonderfully, making it look like they are moving around a space station (that happens to have snakes on it). The game length is absolutely perfect in this one. Once everyone knows the rules, turns usually take less than a minute apiece. We easily get through every game in 20-30 minutes. The addition of the Challenge envelope was a nice touch. It adds a bit of mystery to the game and gives it even more replay value. It would have been great if the snakes were little plastic figures rather than cardboard pieces. Kids seem to really like the look and feel of the mole rats, so it would have been cool if the other major characters in the game were plastic, too. Not a big deal, though. I also worry that a group of kids would have a very tough time winning this game on their own. We’ve played all of our games with at least one adult, and we still lost about half of the games. If you do plan on getting this with younger kids, I recommend joining them for the first five or six games so they can get a feel for how to deal with the snakes. I can confirm that Mole Rats in Space is a Chutes and Ladders killer. It has a more fun theme and it gives everyone more choices to make. Plus, I think most people will agree it has a much better look than Chutes and Ladders. Mole Rats in Space is a must-have for anyone who is looking for a cooperative board game for older kids. It could also work as a family game for those who are looking for a lighter co-op. The board and the mole rats look great, the theme works, and it has plenty of replay value. Thanks for taking the time to read our Mole Rats in Space review! And thank you to Peaceable Kingdom for sending this game to us!